Fifteen years ago, Dr. Marjorie Darrah began working on ways to make it more exciting for students to learn science and math. By using the technology of haptics to add the sense of touch to math and science lessons, she reasoned that student learning would not only be more productive, but also more fun. But the process of moving an idea to a technology sold in the marketplace can take extensive time and resources. In her quest to use technology to more fully engage students in STEM subjects, Dr. Darrah realized that to take her product to market she would need an industry partner and sufficient funding. She found a willing partner in Information Research Corporation (IRC), headquartered in Bridgeport and successfully utilized the Small Business Innovation Research (SBIR) award program through the U.S. Department of Education. 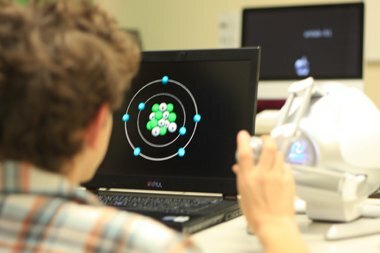 “With a haptic device matched to educational software, students can interact with three dimensional objects that are displayed on a computer screen. They can feel shapes and textures of a plant cell, for example. Or experience the difference in how much objects weigh on other planets, explore a volcano and feel the lava flow, and more,” Dr. Darrah, Associate Professor of Mathematics at WVU, explains. “I couldn’t have launched eTouchSciences without support from Bob Wentz and Brad DeRoos of IRC,” Dr. Darrah said. “Their knowledge in the areas of business planning, marketing, and software development were instrumental in forming the enterprise,” she added. “Dr. Darrah’s vision to make learning math and science more successful and fun was inspiring, and IRC was pleased to work with her on an SBIR proposal in which software would be developed to help students with visual impairments learn science and math more effectively,” Wentz said. Dr. Darrah obtained an entrepreneurial leave of absence from WVU to pursue the business startup, eTouchSciences, which now is a spin-off of Information Research Corporation (IRC). eTouchSciences has developed an innovative learning system that can be used both by students with visual impairments and by sighted students. Twenty software lessons have been developed which are now commercially available (www.etouchsciences.com). 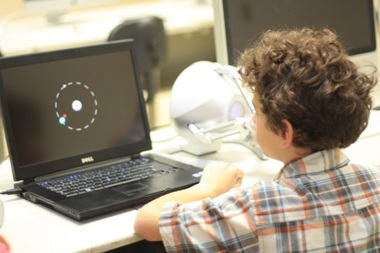 The novel aspect of these science and math lessons – which are targeted toward middle-school students – is that objects on the computer screen can be touched using a haptic (tactile feedback) gaming controller. “I like to say that I took a gaming controller used most often in violent video games and redeemed it for educational purposes,” Dr. Darrah says. To ensure that the apps would work with a wide range of students, Dr. Darrah took them to Space Camp for Interested Visually Impaired Students (SCIVIS) in Huntsville, AL in September of 2012. The results were very positive and demonstrated significant student knowledge gains. Best of all—the students gave it a high rating for enjoyment. When Dr. Darrah began this work, the cost of the device needed to run the software she was developing was about $40,000. Over the years, as technology and manufacturing have improved, the device became much more affordable—around $200—making it affordable for schools. At the same time, Dr. Darrah kept making improvements to her software. The case of eTouchSciences is a model for how academicians can successfully pursue entrepreneurial endeavors. While Dr. Darrah brought her educational skills, subject matter expertise, and technical know-how to the startup, her effective partnership with an industry partner—IRC–helped provide the technical, business and marketing skills needed to launch a new enterprise. eTouch Sciences was awarded the TechConnect Spirit of Innovation Award for “StartUp Innovation of the Year” in 2013. eTouchSciences has made significant market headway and has gained national attention during in the last twelve months. Organizations such as the American Foundation for the Blind (AFB), American Council of the Blind (ACB), and the National Federation of the Blind (NFB) have all reviewed the technology. Additionally, it has garnered support from advocacy groups for the blind. “Dr. Darrah is a role model for women who want to pursue STEM careers, and her example provides motivation for young women throughout the state and region,” Wentz said. For more information, visit http://www.etouchsciences.com/ets. The haptic controller can be used in many ways: it can exert forces against the student’s hand to define the shape of an object in 3D space; it can be used to create spring forces, drag forces, and viscous effect; it can be used to create different textures including smooth surfaces, rough surfaces, and bumpy surfaces; it can be used to guide a student’s hand in a pre-defined path. In the atom lesson, students can feel protons, electrons, neutrons and the orbital rings. In the coral reef lesson, students can feel the shape of fish while they learn important facts; they can also feel the shapes of different species of coral and the texture that these different types of coral have (e.g., you can feel the ridges of brain coral, or the rough texture of elkhorn coral). In the blood cell lesson, students can feel the shape of red blood cells, white blood cells, platelets and even viruses with their spikey protrusions. In the drag app, students can feel the difference in drag forces when the shape or size of an object is changed: the haptic controller exerts increasing or decreasing resistive force depending on the object and fluid incorporated into a scene.